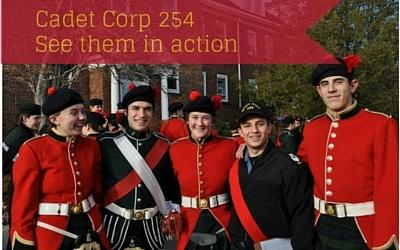 On Thursday, May 23, 2018, the 254 King’s-Edgehill School Cadet Corps turned out in their best uniforms for the final day of Cadet activities. The festivities began with the Corps photo in the Athletic Centre followed by the traditional march downtown through the streets of Windsor to Christ Church. Once the Corps was safely seated, our Chaplain, The Reverend David Curryconducted the Corps Church Parade. Our Head Boy Arturo Ramirez and our Head Girl Drill Sergeant Major, Master Warrant Officer Meredith Chambers gave the formal readings followed by the Reflections from some of the senior Leadership of the Grade 11 Class. All of the cadets had pause for thought as they listened to the description of the role of the Corps and its unifying presence in the life of our School. Upon conclusion of the Church Parade, the Corps marched back to the campus for a quick supper and the finale of the day, the Annual Ceremonial Review. At 6:40pm the Drill Sergeant Major, Master Warrant Officer Meredith Chambers ordered the Markers to take position. With the resounding command of GET ON PARADE, the Corps responded and marched on in sixes accompanied by the music of the Brass and Reed Band and the Bagpipers. Once all was set, the Drill Sergeant Major handed the parade over to the Regimental Sergeant Major, Chief Warrant Officer Ella Jollymore who ordered the Colour Party to take position ordering a General Salute to the Queen’s and Regimental Colors, the traditional rally point of any unit. Promptly at 7:00pm the Pipe Major, Warrant Officer Nicola du Toit piped on the Reviewing Officer Rear Admiral (Ret’d) Elizabeth Stuart. The Corps gave the General Salute and the formal inspection began. 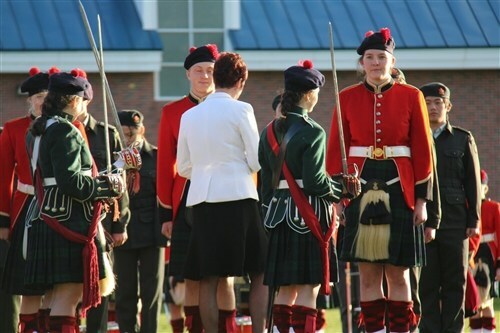 The Cadets, splendidly turned out in Highland Ceremonial and Cadet Greens were indeed a remarkable sight. Following the inspection, the Corps conducted the formal march past before the dais with each subunit delivering an individual salute to the Reviewing Officer. The next stage was the presentation of awards to individual cadets. 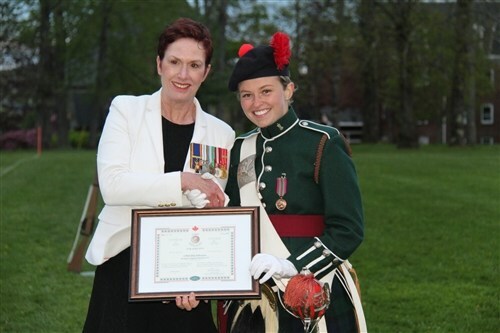 Most notably this year were the presentation of the Lieutenant-General Quinn Award for Musical Excellence to Drum Major Andrew Canete, recognizing him as the Top Army Cadet Musician in Canada. The final award of the evening was the Lord Strathcona Trust Fund Medal to RSM Jollymore. The Advance in Review Order and the final salute wrapped up another year in the history of this storied Cadet Corps. On a personal note as the Commanding Officer, I would like to commend the outstanding efforts of the Corps in this past training year. The individual cadets have comported themselves professionally, the Non-Commissioned Officers and the Warrant Officers have led the unit with distinction. The Sergeant Major and the Regimental Sergeant Major have guided the Corps with a level of maturity far beyond their years. Well done to all. Be More! The King's-Edgehill Cadet Corps is unique in that a large number of the students are outfitted and parade in full Highland Dress Uniforms. To view full-colour pictures, download our Cadet Corps PhotoJournal.